High in the mountains of Estis an ancient stone marks a portal between mortals and angels. The angels have long since stopped interfering in the matters of the world yet there are a group of select few who watch over the land below as powerful Guardians. Each year the most promising individuals from across the lands are invited to take part in the Trials - their prize is to become a Candidate for Guardianship, to train amongst the clouds for a chance to join the elite ones. Yet our story is not focused on those specially invited ones - instead meet Ella, a girl with a mysterious past having been found on the mountainside in a storm just under a year ago and now working as a maid in the local Inn. 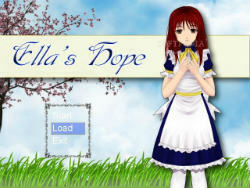 Ella's Hope is full of adventure with 7 playable characters to discover and many quests ahead of you. The mystery of this girl's past is about to have a massive effect on her future.